God who dwells in our hearts, as the Inner Ruler, has been communicating with us in whispers. We just need to cultivate the habit of listening, with our psychic ears wide awake, and with a devout heart. Now and then He would let us know His message in audible words. If we could establish communion with the All-pervading Universal Soul, we get clear messages from that powerful source. God would fully occupy our heart and keep reminding us of our duty. If we faithfully pray to God seeking solutions to our problems, then the first thought that flashes in our mind would be in a way the solution suggested by God. As such, they will prove to be effective at any time.It is but common for the humans to have desires and problems. But, they do not have enough energy to match with the magnitude of their problems. God has infinite power, devoid of any desire. If our desires are surrendered to His feet, then His power envelops our intellect. So, when we are in a confused state as to what to do next, it is enough to remember Baba who is there within us to respond instantly. Like a flash, we get response from Him as to which direction we have to turn to, what is good or bad and the do's and don'ts. 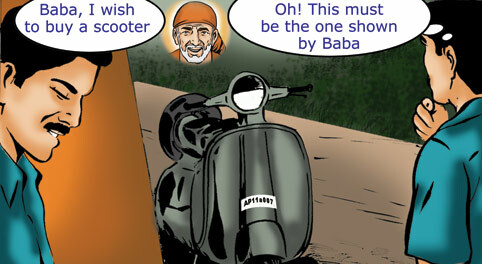 Baba decides what we deserve and hands it over as required. When we follow the silent instructions of Sai, we get good results.